On your way to India! Their menu full of tandoori, biyani and curry will keep you busy for a while. Together with the characteristics of their interior you'll be sure of a very Indian night out- on every day of the week. Of course you can also sit outside on the terrace. Having a big party? No problem here. They offer take-out as well. A really good Indian ! Fantastic food but a ridiculously long wait. We had booked a table at 7pm but Still had to wait ages for a table. Once seated it took an hour for our starter to arrive!!!! No apologies for the wait or complimentary poppadoms which i would have expected to sweeten the mood. The food however was really great. The Lamb starter was particularist good-high quality meat. We will visit again but on a less Busy day. Terrible evening, service was slow. We waited 1 & a half hours for our food & when it came it was not what we ordered. We won’t be going back to this restaurant. Great food in a good location. Excellent service and would definitely return one day. Grote bord en super lekker! It was very cozy and friendly! Very nice staff also helping us to choose and a lot of choices of dishes. Very warm and friendly staff, food was delicious. Chicken Tikkas were awesome and at the end they gave us a free mango ice cream; though we were already full enough but the ice cream was unresistable. Lovely authentic Indian cuisine. Portions were good and staff very attentive. Really good dishes and great service, I recommend the indian red wine! Really enjoyed our meal. sat outside in the evening sun- Dutch environment -Indian food. Heat descriptions of food accurate. House wine not the best for our palate- but was not so expensive -adequate. The restaurant coped well with our gluten intolerance. Having a seperate gluten free/allergy menu would have been a bonus. We would eat here again. We were the only people there, which was a shame. The service was friendly and the food was okay but nothing special. We found the dishes too salty. However, portions were large and the breads were good: chapati, paratha and nan. I don't know why people say the restaurant feels runs down; it doesn't. But it does look like it probably did in the 1980s. In all, a meal that was good enough but not very memorable. This Indian-Pakistani restaurant in Leiden has been our favorite for sometime for Indian food. Food is tasty, and prices are reasonable. Service is done by the owner and his family, and they take genuine interest in their guests. I appreciate the special care they take when you are ordering a takeaway meal (with all the complementary items included). The only minus would be the decor of the restaurant, it looks dated and needs refurbishment. The chairs, tables, furniture are old and cramped in a small area. Delicious Indian food. 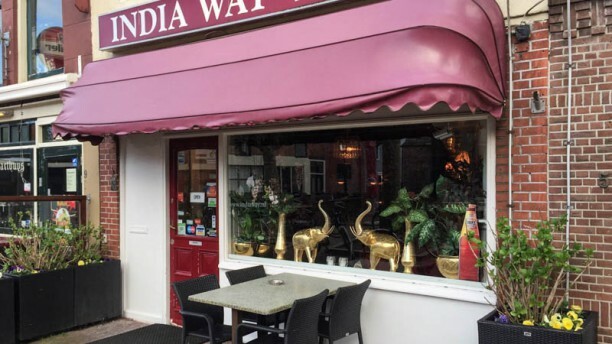 Good service.The food was good and the interior of the restaurant was antique.The moment we walked in we thought we were in India: the music, the atmosphere, the friendliness, the sense of welcome.Food was delicious.Inshort best indian food in Leiden. HIghly recommended.